Exclusive interviews – Design Your Lifestyle. 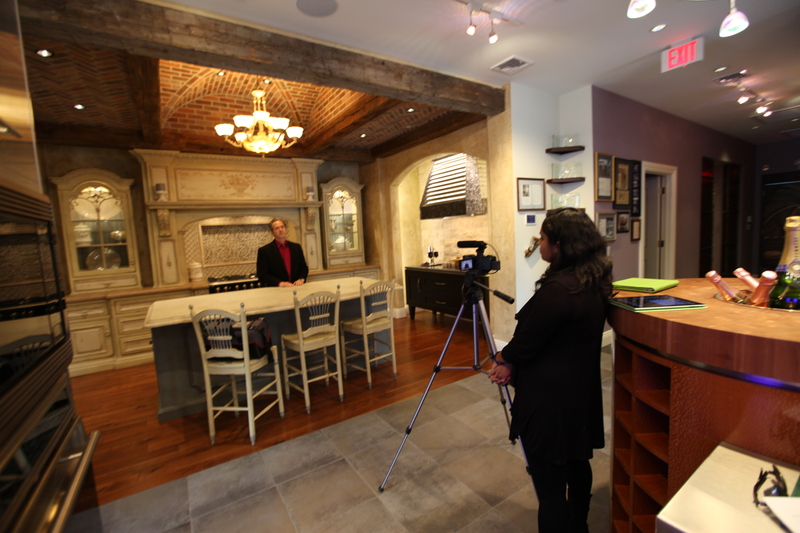 Two years ago, Peter Salerno lent his 30 years of experience as a certified master kitchen and bath designer (CMKBD) to the NKBA in the production of a new video for NKBA University. As was first reported on the NKBA Connect blog, that video of Peter Salerno was featured as a Center Stage Video at the KBIS 2015 convention in Las Vegas. The video was part of a presentation entitled “The Importance of NKBA Certification”, taking place on Tuesday, January 20th from 3:45-4:15 p.m. at KBIS 2015’s Center Stage. The interactive Center Stage presentation was perfect for students, young designers, and experienced designers looking to take their credentials to the next level. That is the opening of a wonderful piece about Peter Salerno, CMKBD – owner of Peter Salerno Inc. (our parent company). In the latest ‘Profiles in Excellence’ article on the NKBA Connect blog, Peter Salerno and the NKBA celebrate the joint benefits their business relationship has created. 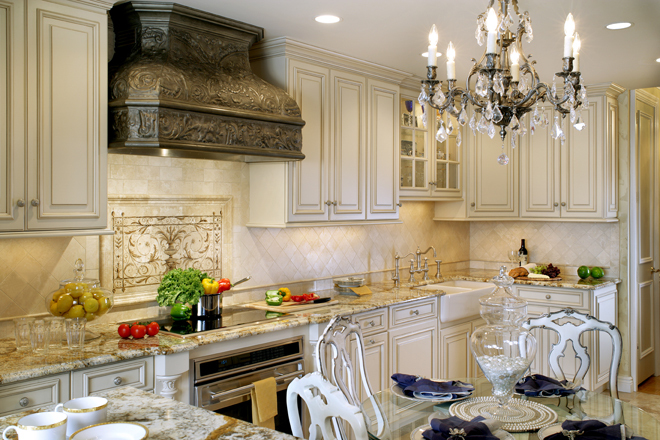 Peter Salerno Inc. is the most award-winning custom kitchen and bath design firm of the 21st century. Many of those design awards were presented by the NKBA and their KBIS conventions. The publicity garnered from these prestigious awards, coupled by the name power and recognition of the NKBA, has led to a great deal of business for Peter and his firm. “Being an NKBA Design Competition winner has given me and my business increased exposure and credibility,“ says Salerno in the article. That exposure has allowed Peter Salerno Inc. to be an annual fixture at KBIS, a featured designer with HGTV, and to install kitchen and bath designs on three continents in multiple countries. A great step that Peter took was obtaining his NKBA Certification, which you can read more about here. Read the full article at the NKBA Connect blog. June 2017 Peter Salerno, Inc.
Peter Salerno (of Peter Salerno Inc.) recently appeared on CBS Radio as part of WCBS 880’s “Small Business Report with Joe Connelly” as an expert on small business growth. Among the topics Peter discussed were Exclusive Designs, Premium-Priced Products, and How to Grow with a Large Partner. As the owner and founder of Peter Salerno Inc., the most award-winning custom kitchen and bath design company of the 21st century, Peter Salerno understands how to balance growth with greatness, and sales with client satisfaction. “One way [Peter] finds new vendors is by going to the small trade shows, because the new vendors can’t afford the big shows,” explains Joe Connelly. Peter has been recognized with an unprecedented 35 national design awards (through June 2017), making him the most award-winning custom kitchen and bath designer in North America. This figure includes 23 national awards from the National Kitchen and Bath Association within the past 10 years. 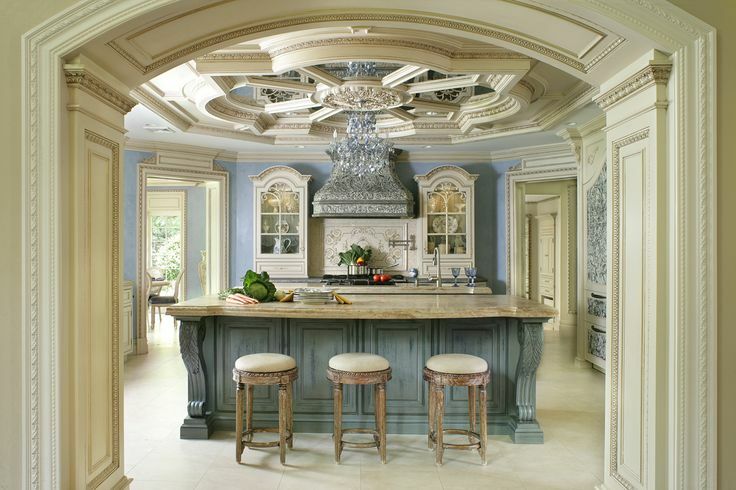 His designs have been published in numerous magazines including Design New Jersey, 201 Magazine, New Jersey Home and Style, Luxury Living, The Robb Report, Woman’s Day, New York Spaces, Millionaire Magazine, 201 Magazine, K+BB, Profiles, Aspire and Kitchen & Bath Design News as well as other numerous trade publications. For more information about Peter and his company, visit the official Peter Salerno Inc. website. April 2016 Peter Salerno, Inc.
What Does This Design Have To Do With Al Capone? World-class custom bathroom design, an award-winning designer, a beautiful New Jersey home, and the notorious Al Capone. What could all these things possibly have in common? You can find out this month by picking up a copy of (201) Magazine’s fantastic Home Issue, featuring an exclusive look inside a gorgeous custom bathroom design by Peter Salerno Inc.‘s Anthony Michael Salerno and Peter Salerno. 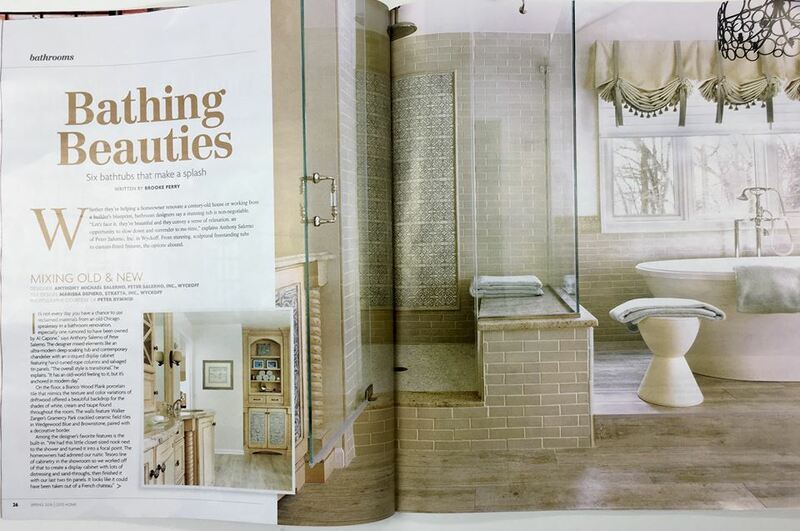 Pick up (201) Magazine’s Home Issue to see a Pete rSalerno Inc. bath design – how does it feature Al Capone? The article, “Bathing Beauties (Six bathtubs that make a splash)”, is a fantastic piece written by Brooke Perry for (201) Magazine. Inside the article lies a beautiful spread of bathroom design photos taken by renowned photographer Peter Rymwid, showcasing this exquisite custom Peter Salerno Inc. bath design. 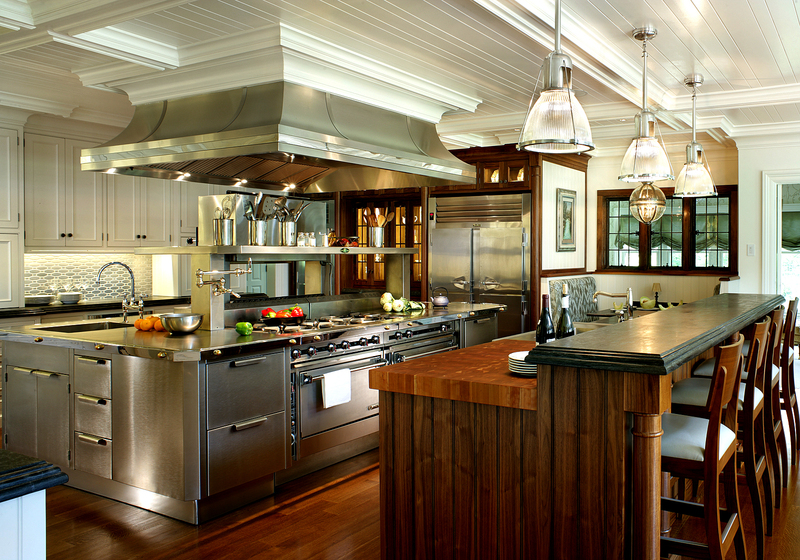 Included in this design is a stunning feature made from reclaimed tin – rumored to have been owned by Al Capone himself! The tin was reclaimed from a Chicago site that was once a speakeasy, which adds even more validity to the claim. The rumored backstory of Al Capone owning the tin that now finds its home in this stunning bath design only adds to its mystique, luxury and charm. The outstanding tile design in this bathroom was imagined by Marissa DePiero of Stratta, The Tile Boutique. Other notable features in this 2016 Peter Salerno Inc. custom bath design include the porcelain tile floor which mimics wood plank, a walk-in shower and the tub itself (a true centerpiece of the design). But don’t take our word for it! Pick up a copy of (201) Magazine’s Home Issue today and see for yourself why this design is truly a “Bathing Beauty”. For more information about Peter Salerno Inc., winner of 34 national design awards since 2002, and to place your own custom bath design order, fill out the contact form below or call (201) 251-6608! 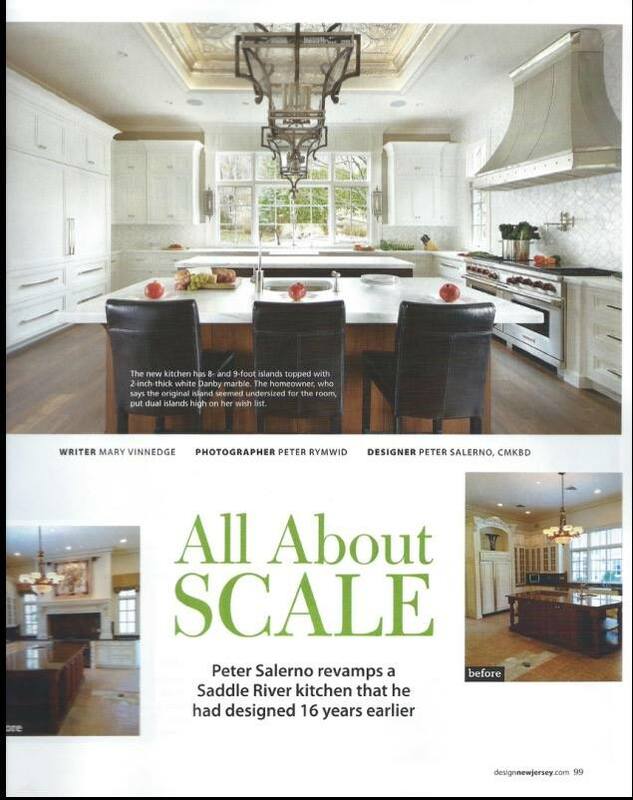 Peter Salerno was recently interviewed by East Coast Home + Design Magazine, one of the premier home design publications in the United States. Fresh off another successful, informative trip to the KBIS 2016 conference, Peter took some time to speak with Cristine Benton of East Coast Home + Design about his experience, his award-winning pedigree, and his design expertise and influences. 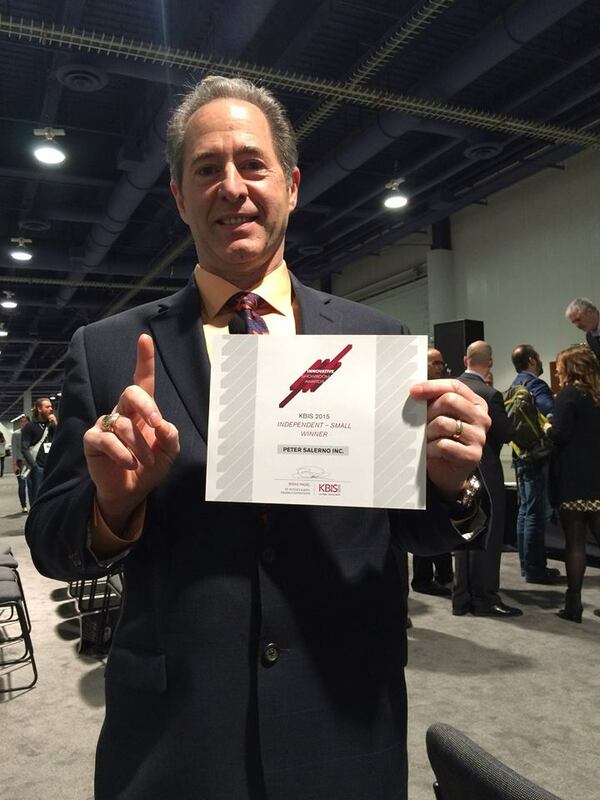 The interview, part of an expansive must-read article entitle “KBIS 2016”, was a great opportunity for Peter Salerno to speak about his time at North America’s best design conference. Other outstanding, notable designers and industry professionals interviewed for this article include Chuck Wheelock and Rebecca Reynolds. Readers of Ms. Benton’s piece in East Coast Home + Design are treated to an inside look at aspects of the KBIS 2016 conference not seen by the public (and even most of the attendees), including the exclusive La Cornue party at the Bellagio and the prestigious NKBA Design Competition and Industry Awards at the Cosmopolitan Hotel. Ms. Benton also notes some design trends omnipresent at KBIS 2016, including “a universal embrace of the contemporary” (over traditional kitchen design), natural stone replicas, and the regional diversification of kitchen color palettes. For example, current homeowners in the Northeast United States looking for transitional kitchen updates prefer white kitchen designs. In all, Cristine Benton presents a comprehensive, clean review of KBIS 2016 (not an easy task given its scope), and provides a must-read piece for kitchen designers and design enthusiasts alike. Be sure to look for this article, which includes contributions by Peter Salerno, in the March 2016 issue of East Coast Home + Design Magazine. Read Exclusive Design New Jersey Article and More! Followers of the official Peter Salerno Inc. blog are familiar with the company’s outstanding relationship with Design New Jersey magazine. Peter Salerno and his team have long viewed Design New Jersey as one of the pre-eminent design magazines not just in New Jersey, but in the United States. It’s always an honor for Peter Salerno and his team to look back on the times Peter Salerno Inc. has been featured in Design New Jersey magazine. One of these articles was in the December/January 2013 issue of Design NJ, when writer Meg Fox outlined Peter Salerno Inc. In her article “The Art of Cabinetry”, Meg Fox interviewed Peter Salerno exclusively for Design New Jersey magazine, discussing both Peter’s gorgeous Wyckoff showroom and his family tradition of fine cabinetry and design. 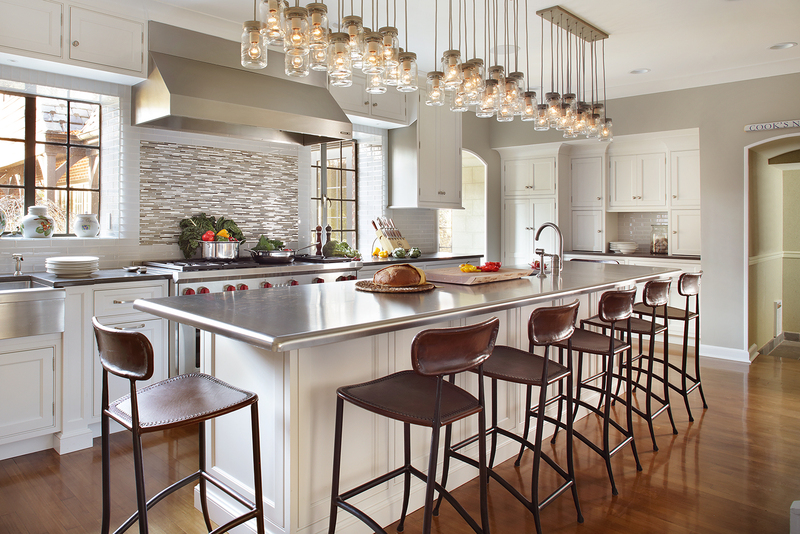 When Peter Salerno, a certified master kitchen and bathroom designer, decided to update his Wyckoff showroom, the word “update” took on a whole new meaning, he says. Triple the size of the old one and with more than double the office space, the new Peter Salerno Inc. showroom in Wyckoff is a complete design center that showcases the most advanced technology and innovative design features. “As a child, my dream was to be an artist,” Salerno says. 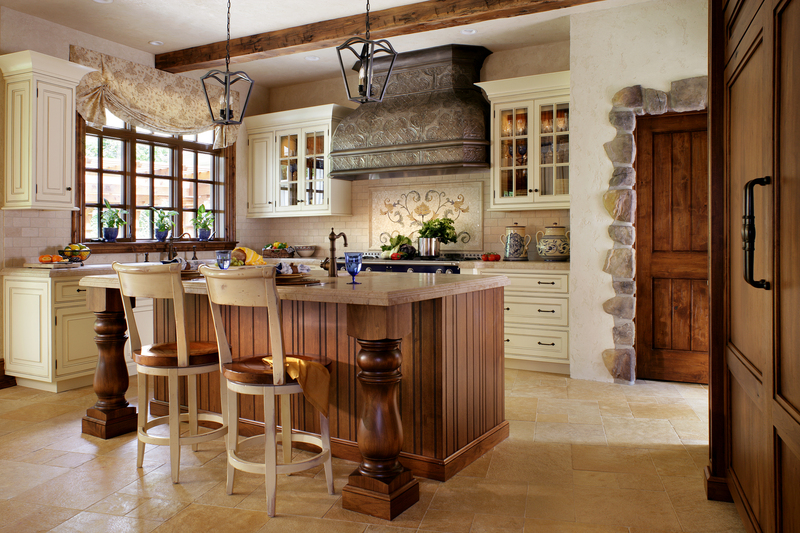 After being in the kitchen and bath industry for over 30 years, he feels he has fulfilled that dream by creating what he calls an “art gallery through cabinetry.” Furniture-quality cabinets are custom made, and the vignettes showcase an assortment of styles and cutting-edge designs that demonstrate the industry’s latest trends. All components—from heating to music and lighting—are controlled from a main panel, iPhone or iPad. 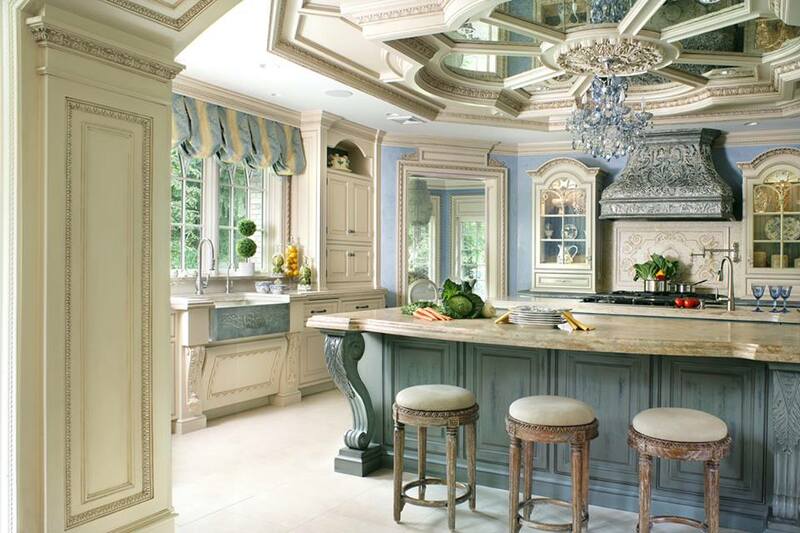 It’s a perfect time to look back on this article, as we’ve spent the latter half of this month discussing Peter Salerno and his award-winning Maestro Rosolino cabinetry line. Take a moment and read the full article, as well as view exclusive Peter Salerno Inc. showroom and design photos!